It is a long story but here is an abridged version. Our eldest daughter started to have health problems around 2011 when she was aged 23 years. It took about two years for her condition to be accurately diagnosed as Ulcerative Colitis. Her ill health impacted on many areas of her life including her career and postponing her wedding day (for twelve months and even then it went ahead on a wing and a prayer). She had successfully completed her degree course and had also attained her Masters degree but she had to step down from her promoted role at work due to her illness. Throughout this time and indeed since, her courage and mental resilience has been incredibly impressive. At present her Colitis is under control and it is just wonderful for all of us who love her to see her able to live life again. 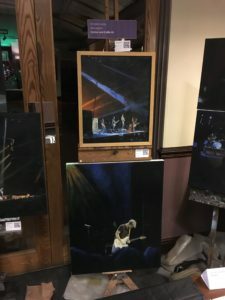 If you do not know, have a look on my website and you will learn that I paint live music performances. 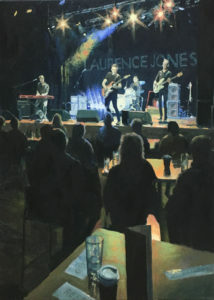 One of the bands that I have painted is the Laurence Jones band. 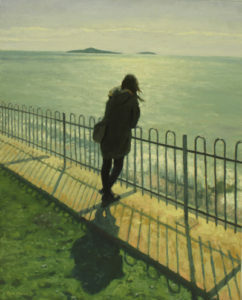 I knew very little about Laurence Jones, the man, and one day whilst in my studio working on the oil on canvas “Laurence Jones At Band On The Wall”, I started to read one of his CD sleeve notes. I discovered that Laurence has Crohns disease. 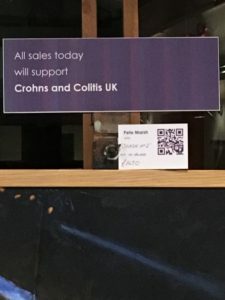 Last week I saw that Laurence is about to do a charity gig in support of the charity Crohns and Colitis UK and I immediately thought that I could offer some support by donating a painting. 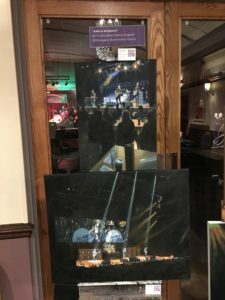 I have produced three paintings inspired by Laurence Jones but “Laurence Jones At Band On The Wall” is currently on exhibition at a gallery in the north of England, “Headlining No.1” is sold (to Laurence Jones) so it seemed it just had to be “Headlining No.2”. 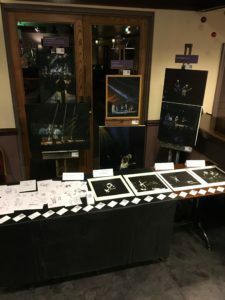 Corn Market Blues, who are promoting the charity gig, have invited me to have a stand (scroll down for UPDATE) at the gig where I will be selling pages from my sketchbook featuring Laurence Jones, Greg Smith (bass), Phil Wilson (drums) and Bennett Holland (keyboard). 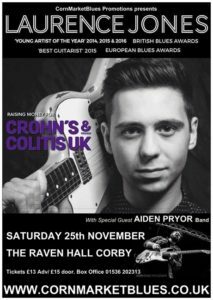 All proceeds from Laurence Jones inspired material will be given to Crohns and Colitis UK. 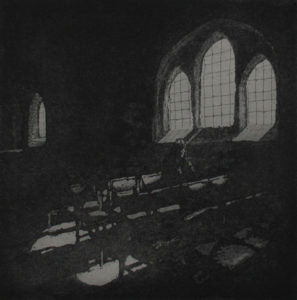 I will also be showing other music inspired works and I will share 50% of these proceeds with the charity. I then produced two paintings which I suppose are intended to express something of the anguish Mel and I were feeling as parents. 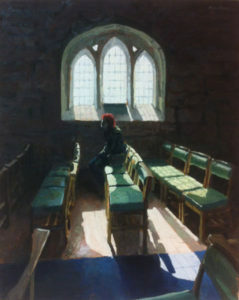 “Thought” was sold a little while ago and “Prayer” is currently for sale at The Biscuit Factory contemporary art gallery in Newcastle-upon-Tyne. What a weekend! 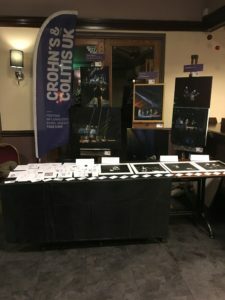 Right, here we go…following Dave Morse’s kind invitation to have a stand at this event, I drove south to Corby in Northamptonshire to set up my stand at The Raven Hotel, the venue for the Laurence Jones charity gig. I was greeted with a really warm welcome from both Dave and his wife….and a lovely cup of tea was just what I needed after the three and a half hour drive. I was introduced to Richard who kept me entertained with various fascinating insights into Walter Trout. It was such a disappointment that I couldn’t spend longer listening to Richard’s experiences. Corn Market Blues provided me with a great position to site my stand…right in the bar area, providing the stand with good lighting and a guaranteed audience! 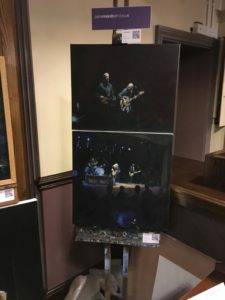 I displayed a six original paintings, including “Headlining N0.2” inspired by Laurence Jones, “The End” inspired by Black Sabbath, “Slash No.2” inspired by, yes you’ve guessed it, Slash, “KWS No.2” inspired by Kenny Wayne Shepherd, “Live” inspired by Wilko Johnson and “Absorption” inspired by Joanne Shaw Taylor. 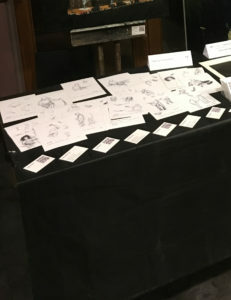 On the table I displayed “live” drawing from my sketchbooks of the Laurence Jones band…done during sound-checks at Band On The Wall, Manchester, The Grand Venue, Clitheroe and The Ritz, Manchester. These sketches are done extremely quickly whilst Laurence, Phil, Bennett and Gregg are moving around on stage. Also on display were limited edition lino-cuts inspired by Chantel McGregor, Aynsley Lister, Kenny Wayne Shepherd and Noah Hunt and Slash. When the band had completed their sound-check, Dave Morse invited me to join the band for a meal before doors opened at 7.30pm. I ordered steak-pie and chips and although it was cooked to perfection the size of the meal beat me! Massive thanks to Dave for extending me this courtesy….on my drive to the venue I had monitored places to where I might sneak out to order a sandwich. This meal set me up nicely for the remainder of the evening and the three hour drive back to Greater Manchester. The support act for the evening was Aiden Pryor Band who I had not seen before. The band put on a terrific show of their own compositions with a couple of Rory Gallagher numbers included. It can be a mine-field when artists try to do Rory songs but Aiden Pryor pulled them off with an authenticity of his own whilst maintaining a testimony to Rory, one of my all time favourite live performers. 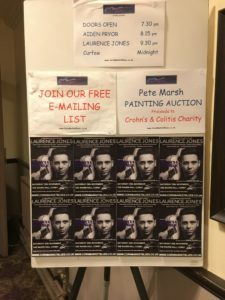 The auction was to follow Aiden’s set and Ben Rutter from Crohns and Colitis UK performed brilliantly as auctioneer and the painting “Headlining No.2” was sold for £310 to Nigel, a regular at Corn Market Blues gigs. 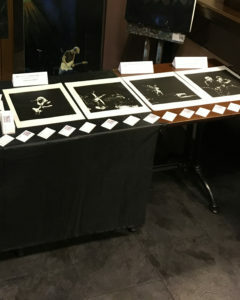 Further sales included a page from a sketchbook and a lino-cut of Slash…bringing the total raised for Crohns and Colitis UK from the sale of my work to £347.50. My raison d’etre for being at the gig was to try to raise some funds for the charity so it was a special bonus to see the Laurence Jones band again. We were treated to another superb set from Gregg, Bennett, Phil and Laurence….just loved that groove, man! I arrived home around 3.00am still smiling from what had been a great evening spent with thoroughly decent folk, but I was left wanting to hear more from Richard about Walter Trout and of course looking forward to seeing and hearing more from the Aiden Pryor and Laurence Jones bands again.